Fresh ginger juice adds a particular zing to a marinade: the fragrant, hot flavour penetrates into meat, poultry, fish and seafood, while helping to tenderise at the same time. The sesame seeds in this recipe add texture, the fish sauce adds saltiness, and the sweet-and-sour blend of sugar and lime juice completes the Asian credentials of this marinade. 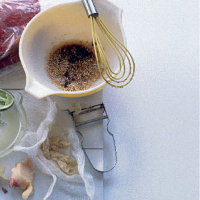 The marinade- Put the ginger in a fine sieve, or a sieve lined with muslin, and press the juice into a bowl. You need to extract 100ml ginger juice – add a little water to the ginger pulp and squeeze again if necessary. Add the remaining ingredients, except the sugar, and stir to mix. Put the meat or seafood in a non-metallic shallow dish and rub the marinade all over. For meat, cover and leave in the fridge for at least 4 hours or overnight. Fish and prawns only need marinating for up to 30 minutes in the refrigerator. Remember to give the marinated food at least 20 minutes to return to room temperature before cooking. To cook- While cooking the food, season and baste it with the marinade. Before brushing the final few strokes on, add the sugar and stir to dissolve; this helps glaze the food, but if the sugar is added too soon, it will burn and stick.